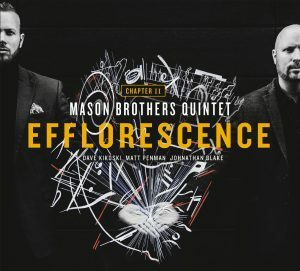 The Mason brothers—trumpeter Brad and trombonist Elliot—have been making music together since they were kids in Norwich, England. Both came to America in the early 1990s on scholarships to Boston’s Berklee College of Music and, after graduating and relocating to New York City, have distinguished themselves in a number of challenging musical settings—Elliot with the Mingus Big Band, Count Basie Orchestra, Maria Schneider Orchestra, and, since 2007, the Jazz at Lincoln Center Orchestra directed by Wynton Marsalis, and Brad with Natalie Cole, Mike Stern, Randy Brecker, Lionel Loueke, the Mingus Big Band, and, since 2007, singer-songwriter John Mayer’s band. Now, at long last, the brothers have gotten together to release a self-produced CD of their own straight-ahead, cutting-edge jazz, due out October 5 on their Archival Records label. Five of the eight tunes on the Mason brothers’ “Two Sides, One Story,” were penned by Elliot, including “Stage Pints,” a clever anagram for “Giant Steps” on which the melody of the famous John Coltrane composition is played backwards over the song’s original chord changes. Brad and Elliot collaborated in writing the remaining three selections. Tagged Archival Records, Brad Mason, CD, Elliot Mason, Mason Brothers Quintet, Review, Sopa de Blues, Two Sides One Story.